As a business owner, you want your company’s website to get noticed. Having a website that shows up at the top of a search results page can get you the organic traffic you need to boost your company’s web presence and gain views from prospective clients. Having a website full of interesting, frequently-updated content with keywords that help your business land at the top of a search engine results page can help set you apart from the competition and generate the new leads you need to grow your business. But when it comes to web content, what’s more important? High-quality, engaging original content with a fresh voice that helps define your business, or a high quantity of new blog posts being uploaded several times a week? Ideally, you want to aim for both, with content that not only effectively markets your products or services but also entertains, informs and engages your target audience, all while remaining fresh and relevant from week to week. To avoid being buried by the competition when generating leads from local search results, try to select a web content provider who can keep up with the demand for new blogs and articles that are relevant to your company while retaining the quality and originality that keeps visitors interested in returning to your website. 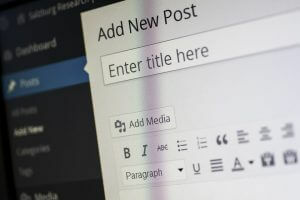 Many web content providers have no problem churning out high quantities of blog posts, service pages, and articles for their clients’ websites, but the quality of the content can sometimes suffer, with grammatical errors and typos, redundancy, and writing that is just plain dull and flavorless. Other providers may have content that is overall better and more engaging, but may charge a much higher amount for their services and be unable to meet the demand for updated content on a regular basis. When looking for a web content provider, it is important to make sure that the blog posts and articles it produces are of a high quality that helps sell your product or service to prospects while helping to build your brand reputation, and also that you won’t have to worry about content not being updated regularly to keep the flow of web traffic moving in your website’s direction. As tempting as it can be to save money, selecting a bargain web content provider for writing that is less than satisfactory will ultimately not be worth the extra savings, and in fact prove to be a waste of your valuable marketing budget. When selecting a provider of fresh, exciting content for your company’s website, make sure to choose a firm that will help cement your brand and its attitude into the minds of your prospective customers so they can get a good feel of who you are and what you sell. Effective marketing begins with engaging, high-quality web content that gets your business noticed!